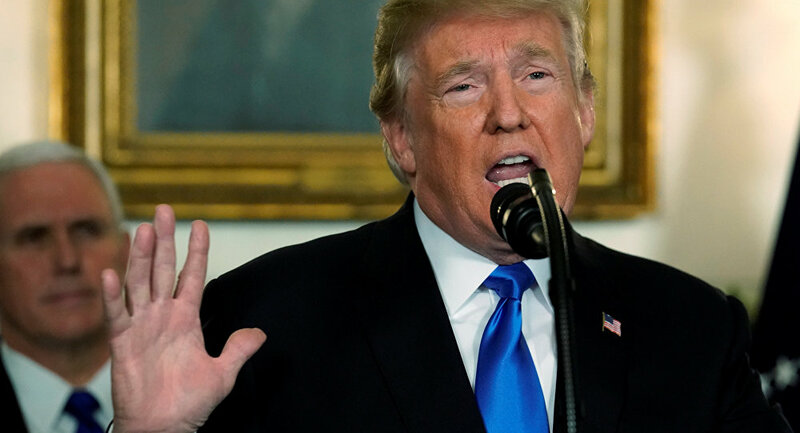 President Donald Trump has said the United States recognized Jerusalem, rather than Tel Aviv, as the capital of Israel. A prominent US evangelical Christian leader spoke to Sputnik about why Trump’s decision brings humanity closer to "the end of days" and the Second Coming of the Messiah. World leaders, including Pope Francis, have condemned the United States' plans to recognize the disputed holy city of Jerusalem as Israel's capital. But President Trump's move is music to the ears of 50 million evangelical Christians in the US who unreservedly support Israel and believe the Jewish state is an important part of a Biblical prophecy which would lead to Armageddon, the "end of days" and the Second Coming of Jesus. Dr. David Reagan, the founder and director of the Texas-based Lamb and Lion Ministries, spoke to Sputnik and said he welcomed Mr. Trump's decision to recognize Jerusalem as the capital of Israel. "I totally support his decision because Jerusalem is the capital of Israel, always has been for 4,000 years. The Jews have had that as their capital and it has never ever in all of history been the capital of another state, not a Muslim state or an Arab state. It is long overdue. Every US president has made a promise to move the embassy as part of their campaign and then as soon as they're elected they forget about it. But this is a good indication that Trump will keep his campaign promises," Dr. Reagan told Sputnik. Dr. Reagan produces a weekly program, Christ in Prophecy, which is broadcast on 13 Christian TV channels to 80 million homes in the US. Although most Jewish voters chose Hillary Clinton in last year's US presidential election, evangelical Christians voted overwhelmingly for Trump and many of them believe the "end of days" is just around the corner. Zionists believe they must build the Third Temple in Jerusalem. Evangelicals believe this will lead to Armageddon. White Supremacists believe they are fighting a Crusade. And, after all, when has claiming control of Jerusalem ever provoked centuries of war? Those who believe in "end times" theology believe the Jewish people must maintain control of Jerusalem and build a third Jewish temple on the Temple Mount, which is currently occupied by the al-Aqsa mosque, one of the holiest sites in Islam. The first and second Jewish temples were destroyed by the Babylonians and the Romans many centuries ago. Dr. Reagan, who has studied Biblical prophecies for many years, explained how he foresaw the end of the world. He said first would come the "Rapture", a moment when the true believers in God — including the 50 million evangelical Christians — suddenly disappeared from the Earth and were taken to Heaven, where they became immortal. In 2014 actor Nicolas Cage played a transatlantic pilot who has dozens of his passengers vanish in a film, Left Behind, which pictured the Rapture taking place in the US. The film was financed by Stoney Lake Entertainment, a company which is "focused on producing big budget faith-themed films for a wider audience." After the Rapture evangelicals believe there would follow a period called the "Great Tribulation", which Dr. Reagan said would last seven years. "Evangelical Christians in America generally agree that most likely there will be a war against Israel which the scriptures call the 'war of annihilation' in which all the Muslim nations which have a common border with Israel, will attack Israel and Israel will defeat them. Then the Arab world will go into a panic and cry out for Russia to come to their aid. And the Russians will come down with a specified group of Muslim nations, countries like Persia (Iran) and Turkey and they will be destroyed on the mountains of Israel," Dr. Reagan told Sputnik. "Then at that point we believe a person called the Antichrist will rise to power in the European Union and he will try to settle the situation in the Middle East. He will go and make a treaty with Israel to guarantee a peace in the Middle East. And we believe…that the moment he signs that agreement with Israel that is when the tribulation will begin," he told Sputnik. "He (the Antichrist) will have risen to power peacefully through his charisma and his super-intelligence in Europe and then he will seek to make a worldwide empire. He will launch a war for the purposes of the conquering the world…and that war morphs into a nuclear war and by the middle of the tribulation he has the control of all the nations of the Earth," Dr. Reagan told Sputnik. In 2008 a number of Christian internet forums concluded Tony Blair was the Antichrist while there has also been discussion among evangelicals that the Antichrist was Prince Charles, Vladimir Putin or Recep Tayyip Erdogan. Dr. Reagan is convinced the Antichrist will be of "Roman origin". "He (the Antichrist) marches into Jerusalem and goes into the rebuilt temple, which will have been rebuilt during the first three and a half years of the tribulation, and declares himself to be God. The Jews will immediately reject him and he will begin to persecute them and try to annihilate them from the face of the Earth. We believe Satan hates the Jews with a passion because it was through them that God gave the Bible and it was through them that God gave the Messiah…and Satan hates them and will try to destroy them once again, like he did in the Holocaust," Dr. Reagan told Sputnik. ​He said there would then be a revolt in Asia and armies would then march out of the Far East, possibly a Chinese army, to fight the Antichrist. Dr. Reagan even believed it was significant for the prophecies that China was in the process of constructing a new highway across Asia leading to the Middle East. "When they are gathered in the valley of Armageddon at that point Jesus will return to the Mount of Olives in Jerusalem, he will speak a supernatural word and will destroy all the armies of the Antichrist and he will begin to reign over all the Earth. He will reign for a thousand years, what we call the millennial reign," Dr. Reagan told Sputnik. Dr. Reagan also said that all those who refused to accept God and Jesus would be "consigned to death" while those who accepted him would live for a thousand years. The Bible was written several centuries before the Prophet Mohammed, the creation of Islam and the Jewish diaspora which changed the demographic make up of Palestine. In 1967 Israel conquered and annexed the eastern half of Jerusalem, including the old city, during the Six Day War with Jordan and has refused to leave despite United Nations resolutions. Israel has always regarded Jerusalem as its capital but the Palestinians want East Jerusalem, which traditionally had a large Arab and Muslim population, to be the capital of a Palestinian state. "Trump's decision violates international resolutions and undermines efforts to achieve peace in the region, and it also represents the US statement of abandoning sponsorship of the peace process," Palestinian leader Mahmoud Abbas said on Wednesday. Jordan acts as custodian of the Islamic sites in Jerusalem — known as al-Quds in Arabic — and Jordan's King Abdullah said Trump's move had "dangerous repercussions on the stability and security of the region." The views expressed by Dr. David Reagan do not necessarily reflect the official position of Sputnik.